When the mass labor migration of women to the Middle East began in the early 1980's, many Sri Lankan social scientists predicted a revolution in gender equality and a greater participation by women in political and economic decision-making as a result of employment abroad. 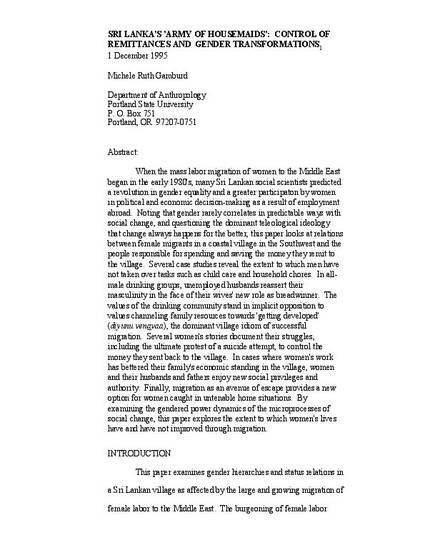 Noting that gender rarely correlates in predictable ways with social change, and questioning the dominant teleological ideology that change always happens for the better, this paper looks at relations between female migrants in a coastal village in the Southwest and the people responsible for spending and saving the money they remit to the village. Several case studies reveal the extent to which men have not taken over tasks such as child care and household chores. In allmale drinking groups, unemployed husbands reassert their masculinity in the face of their wives' new role as breadwinner. The values of the drinking community stand in implicit opposition to values channeling family resources towards 'getting developed' (diyunu venavaa), the dominant village idiom of successful migration. Several women's stories document their struggles, including the ultimate protest of a suicide attempt, to control the money they sent back to the village. In cases where women's work has bettered their family's economic standing in the village, women and their husbands and fathers enjoy new social privileges and authority. Finally, migration as an avenue of escape provides a new option for women caught in untenable home situations. By examining the gendered power dynamics of the microprocesses of social change, this paper explores the extent to which women's lives have and have not improved through migration. This is the author’s version of a work that was accepted for publication in Anthropologica. Changes resulting from the publishing process, such as peer review, editing, corrections, structural formatting, and other quality control mechanisms may not be reflected in this document. Changes may have been made to this work since it was submitted for publication. A definitive version was subsequently published in Anthropologica, Vol. 37, No. 1, Women's Words, Women's Lives (1995), pp. 49-88. Permission to post granted from UTPress.